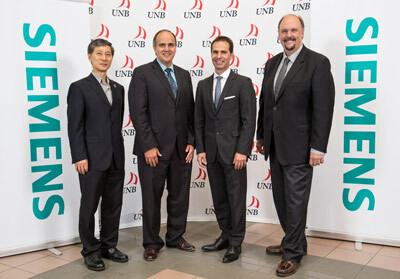 Siemens Canada and the University of New Brunswick (UNB) have agreed on the scope of two research projects looking at smart grid technology that could begin as early as spring 2014. Siemens' has committed to investing up to $2.5 million CAD into academic research projects in the province of New Brunswick over the next five years in the form of funds, in-kind contributions such as software and equipment, as well as sponsorships and human resources. The agreement on these first two projects with the University of New Brunswick is an early milestone in Siemens' fulfillment of this commitment. "Siemens is excited to partner with a respected institution like the University of New Brunswick," says Robert Hardt, President & CEO, Siemens Canada Limited. "We believe that educational investments and resulting research activities will further the creation of a skilled workforce capable of developing global smart grid solutions, and that this in turn will bring significant benefits to the energy and related economic sectors of New Brunswick." Siemens and UNB are currently assembling project teams for these first two projects and are developing proposals for funding from the Natural Sciences and Engineering Research Council (NSERC). The projects, both to be led by the university’s department of electrical and computer engineering under Professor Liuchen Chang, will focus on two elements of smart grid technology and implementation: Residential Demand Response and Load Shifting. Demand Response (DR) programs aim to decrease electricity consumption or shift it from on-peak to off-peak periods depending on consumers’ preferences and lifestyles. Load shifting is a strategy that attempts to "shift" demand for electricity so that less power is used during expensive peak times. "The University of New Brunswick is proud to partner with Siemens, a renowned business and innovation leader," says Dr. David Burns, Vice President (Research) at the University of New Brunswick. "We are excited for the opportunity to collaborate in the research and development of smart grid solutions that will benefit New Brunswick and beyond. This partnership is a great model of how a university can work collectively with industry to create win-win outcomes." The investment further strengthens Siemens commitment to New Brunswick and to continuously expanding its presence in the province. In 2012 the company responded to NB Power's call for a partner to help develop its vision for a comprehensive smart grid program for the province. As part of the multi-year agreement signed between Siemens and NB Power, in 2013, Siemens established a Smart Grid Centre of Competence and application centre in Fredericton, New Brunswick. Siemens and NB Power will bring new energy products and services to New Brunswickers for the next 10 years. For more than 100 years the innovative ideas from Siemens have helped make Canada a better place. From the Atlantic to Pacific oceans, more than 4,500 employees in Canada work together to provide answers that last in the fields of industry, energy, healthcare and infrastructure solutions for cities. Since it was federally chartered in 1912, Siemens has stood for technical achievements, innovation, quality and reliability. Sales for Siemens in Canada in fiscal 2012 (ended September 30), were $2.1 billion CAD. The company has 53 offices and 14 manufacturing/assembly facilities across Canada. Further information is available at www.siemens.ca.